ReLIFE is an anime that follows the story of 27-year-old Kaizaki Arata as he is given the chance to re-attend high school for one year after taking a pill that changes his appearance to that of a 17-year-old. The entire 13 episode series was released all at once this summer on Crunchyroll. I binged through the whole thing and quite enjoyed the show, but there’s one character that really stood out for me. 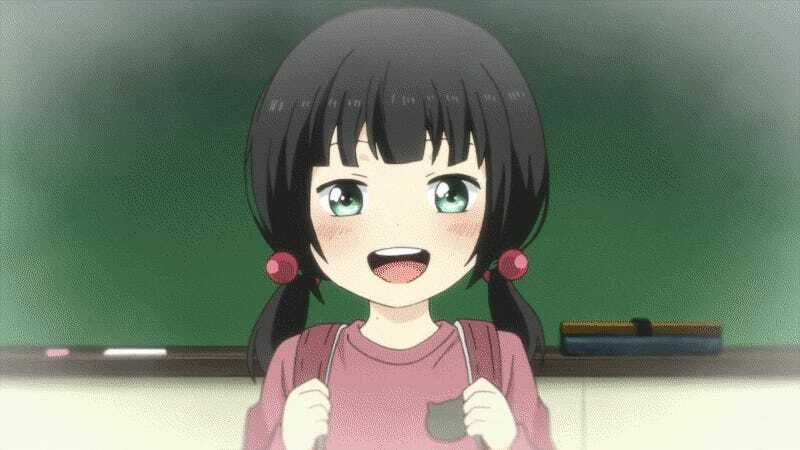 Hishiro is a fellow student in Kaizaki’s class. She is reserved and quiet, socially awkward, and... as seen above, absolutely terrible at smiling consciously. She is concerned about her lack of friends, and has a strong desire to make them, but her complete lack of social skills ruins just about every attempt. These things stood out to me because it was as if the show were portraying a female version of me. I’ve found myself able to relate to characters before, but never at this level. With Hishiro, it actually hits remarkably close to home. 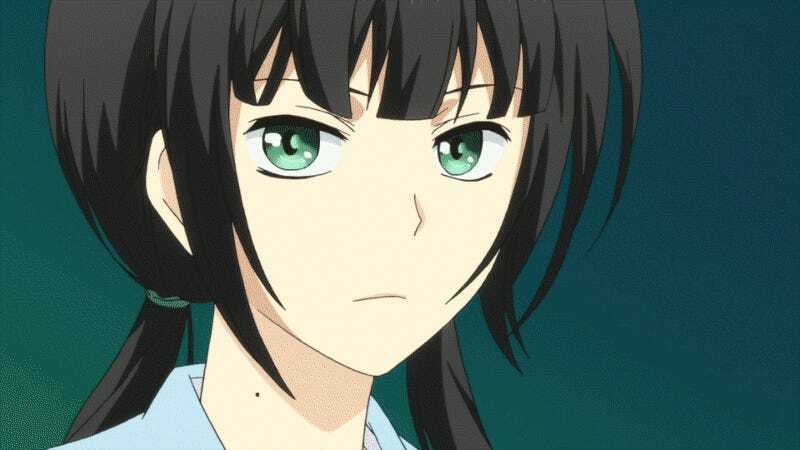 Even while I was seeing myself in Hishiro’s interactions, and sympathizing with her the whole way, nothing could have prepared me for the punch in the gut that is her backstory. It turns out there is a reason she is the way she is, and it aligns with one of the reasons I’ve always thought I am the same way. Her family moved a lot when she was a kid, and she transferred schools constantly. Every time she made new friends, she would have to say goodbye and lose them all too soon. The visual sequence that accompanied this information was absolutely heartbreaking for me. She explains that the constant transfers and loss of friends slowly made her numb to it all, “Was there any point to me being there? I grew convinced that no one would ever remember me. I gave up on knowing people, and this mess is the result.” I was not ready for this scene, and one could certainly say that tears, uh, may have been shed. Possibly. Because I’ve been through the same thing, and I understand all too well the numbness she felt. When I was a kid, and before the internet was this awesome thing that could keep people together across distances, my family moved constantly to different cities in California. This happened once every one or two years or so. The best I had managed was at our final location in California, where we had stayed for 3 whole years from 2nd through 4th grade and I had actually been able to make several friends. Then we moved the farthest distance of all, from California to Minnesota. This was the major turning point. A completely new state, and I felt like a total outsider. In 5th grade, I made a grand total of one friend. One year later, my family moved again. This time, it was just the next town over, so I didn’t immediately lose the friend I had made, but now that we weren’t in the same school, and me the huge introvert that I am, it was harder to stay in touch and over the years we drifted apart. I’ve had very few friends since. Every time I made one, we’d always drift apart within a year or two. I’ve often wondered if maybe the constant moving conditioned me to accept that friendships just aren’t supposed to last. So I’ve felt that numbness myself at various times ever since the move to Minnesota. I’ve also had a very similar thought along the way, “Why even bother making any more friends? I’m just going to lose them if I do.” Hishiro’s words closely echoed this. I could relate to Hishiro’s childhood and the numbness that she felt, but the revelations of her past didn’t stop there. As the series wraps up, it is revealed that Hishiro is actually Test Subject 001, the person that signed up for ReLIFE before Kaizaki did. It’s a small little detail that has huge implications about the character. The discovery for me was a little sad, but also comforting in a way, because it completed the parallels between this character and myself. With that one final twist, Hishiro is revealed to not actually be a real high school girl, which means that - like me - she has struggled with her lack of friends or a social life and the desire for things to not be that way well into adulthood. So much so that she signed up for ReLIFE in hopes of changing herself and turning things around. While I myself obviously did not sign up for ReLIFE as that is not an option available outside of works of fiction... Three years ago, I got so sick of the emptiness, the numbness of not having any friends, that I did the only thing I could think of to work toward fixing the issue - I started looking for online communities to reach out and become involved with and make friends along the way. If I couldn’t manage making friends offline, then the internet would have to do, and that is what eventually lead me to AniTAY. In the sense that ReLIFE is a “second chance” of sorts to turn your life around, I suppose you could consider my online interactions here could be considered my own personal version of ReLIFE. It’s these special moments in an anime, game, or other form of media that can push your opinion of it from “good” to “great” or better on a very personal level. ReLIFE as a whole may not make it on my list of favorites, but if I kept a list of anime that resonated with me, ReLIFE would most certainly be on it. It might even top it, and that says a lot considering the shows it would be competing with. For me, ReLIFE was something special that doesn’t come around very often. It wasn’t a life-changing experience to watch, but it definitely left an impact.